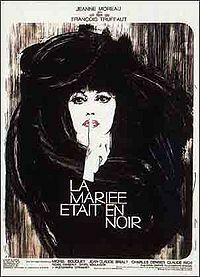 The Bride Wore Black (French: La Mariée était en noir) is a 1968 French film directed by François Truffaut and based on the novel of the same name by Cornell Woolrich. It stars Jeanne Moreau, Charles Denner, Alexandra Stewart, Michel Bouquet, Michael Lonsdale, Claude Rich, and Jean-Claude Brialy. It is a revenge film in which five men make a young bride a widow on her wedding day. She takes her revenge, methodically killing each of the five men using various methods.